My So-Called Soundtrack: Christmasongs: Happy Hanukkah! According to the Hebrew calendar, today is the 25th day of Kislev, more commonly observed as the kick off to Hanukkah. Don’t feel bad if the eight-day Festival of Lights snuck up on you again this year. Since Jewish holidays aren’t based on the internationalized Gregorian calendar, they seemingly fall on different days each year. Due to the differences in marking the passage of time and days, Hanukkah can actually be celebrated as early as late November or as late as the end of December. While Hanukkah in 2013 is set to be observed just a few days after Thanksgiving (November 27), this year’s celebration starts about as close to Christmas as you can hope for. So I say we all do our own part to demystify the aura of the menorah and I’ll start with a “Hanukkah Crash Course” and some awesome Hanukkah-inspired tunes. While I’m no scholar, here’s goes… In 175 BCE, Greek ruler Antiochus IV invaded Judea, recaptured Jerusalem, outlawed Judaism and desecrated the Holy Temple. Not only could Jews no longer openly practice their beliefs and customs, but Antiochus IV went so far as to ransack the Holy Temple and to sacrifice pigs on the altar. This caused a giant backlash of uprising and guerilla warfare (commonly referred to as the Maccabean Revolt, “maccabean” being taken from the Jewish word for “hammer”) that allowed the Jewish people to reclaim the city and the Holy Temple. They had to repurify the temple by creating new holy vessels and by building a brand new altar. They were only able to find one undefiled container of oil for the temple’s menorah and it was only enough to last through one night’s burning. However, the oil burned for eight days straight, which was the exact time it took for the priests to prepare more oil for the menorah. Hanukkah was established to celebrate, among other things, the rededication of the temple and the miracle of the oil. Adam Sandler first introduced “The Chanukah Song” in 1994 on Saturday Night Live during an episode of “Weekend Update.” They played it a ton on the radio stations where I lived and I learned the simple chords and lyrics to earn some cool points with my school and church friends. Adam’s currently released three different versions of the song with an ever-revolving cast of Jewish and non-Jewish celebrities. Although they are all hilarious, the first version will always hold a special place for it’s sheer out-of-nowhere awesomeness. Stephen Colbert released his holiday special, A Colbert Christmas: The Greatest Gift of All! in 2008 and it is filled with ridiculously funny songs and guest stars. Among them is the holiday invitational duet, “Can I Interest You In Hannukah?” sung with Jon Stewart. Much like Sandler’s song, this one is incredibly clever and the first few times you hear it you’re guaranteed to miss a line or two from laughter. Save Ferris was one of those third wave ska bands from the 90’s that I thought should’ve gotten more recognition. I loved their It Means Everything album from 1997 and it’s a shame that there was apparently only room for No Doubt in the “girl-fronted ska band” category. Save Ferris’ “Christmas Wrapping” is a fun take on The Waitresses’ song that changes all the lyrics by subbing in Hanukkah references. 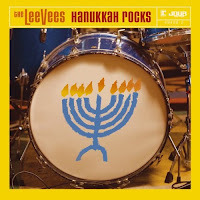 When members of Guster and The Zambonies got together to form The LeeVees, they had only one goal in mind; write an entire album’s worth of Hanukkah songs. They succeeded and Hanukkah Rocks was released in 2005. The album has a great sonic sound to it and songs titles like “Jewish Girls (at the Matzoh Ball)” and “Gelt Melts” should tell you all you need to know. May favorite song takes on the spelling dilemma that surrounds Hanukkah and is appropriately titled “How Do You Spell Channukkahh?” to help confuse things even further.